Orr is a 7 month old male who weighs 80lbs!! He is the most loyal loving dog I have ever seen. I cannot wait for him to see the first snow of the year! He is going to love it! Hello Jennifer, and thank you so much for sharing your great story about your wonderful German Shepherd puppy Mr. Orr. It's always nice to hear about all our baby German Shepherds out there. And I'll bet when he saw his first snow that he had a blast. 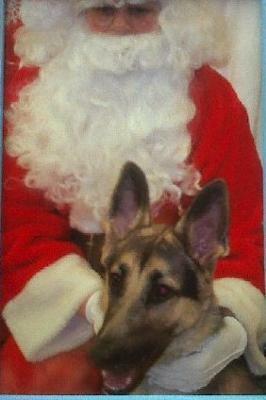 Comments for German Shepherd, Mr. Orr and Santa! Orr loved the snow :) It was so much fun to see him running around in it. Now when he goes outside he just lays in it sometimes. A few of his toys were buried underneath the snow, it was so much fun watching him dig threw the snow to get them out :) He is SO much fun! I am sure that Mr. Orr will love the snow. GSDs do. I have a male GSD puppy named Rambo who is 11 months old, and who recently experienced his first snow. He kept on jumping up with his mouth open and caught the snowflakes in his mouth. It was a pleasure to watch him play like that. You will have as much fun as your puppy watching him play with the snow and playing along with him. Enjoy!